The PLAY:1 speaker is the newest member of the Sonos speaker family. It is constructed quite compactly with an attractive 360° design. Typical for Sonos, this speaker is equipped with only three buttons and an ethernet port. Most speakers have some basic features that can be controlled directly on the device (volume level, on/off). The half-pint is the most affordable way to get started with the Sonos multiroom world. They come as low as 218  while you can make significant savings if you buy two speakers. There is black and white color to choose and the build quality is outstanding. The speaker is covered with an aluminum grid and the plastic case has pleasant haptics. Thanks to the few buttons, the speaker is also easy to clean: Simply wipe it with a cloth and you're good! The overall concept of Sonos provides attractive options: You can start with only one PLAY:1  and extend your multiroom system based on this speaker. Even your TV can be integrated. The Playbar will be used as front speakers while two PLAY:1 speakers serve as rear speakers for an impressive 5.1 surround experience. The back side of the speakers has a screw thread for wall mounting. Obviously, the PLAY:1 is not only meant for small rooms but also for households with big plans. The power adapter is integrated within the small case. The cable lines up precisely with the bottom side and is fitted very firmly, which I like. Also, another nice detail, the cable of the white color version is, of course, white. The speaker also comes with a flat network cable used to connect the speaker to the router. This facilitates setup with the Sonos controller app. 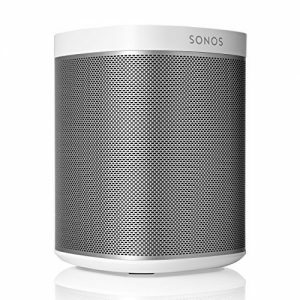 The speaker can be operated without network cable, though  please see the more detailed Sonos article for more information. The power cable precisely lines up with the bottom side. The speaker itself comes with only three buttons: Volume up, volume down and play/pause/mute. I am missing programmable direct choice buttons for favorite radio stations. And, different from the bigger PLAY:5 speaker, there is no way to directly play music from external devices through AUX or USB. Given the small size of the speaker, the sound is impressive, indeed. It is clear on low as well as on high volume levels without distorting. The bass is rich and full and not tinny at all. Music can be played at very high volume levels, whereas sound won't be good any more in very loud playback. An equalizer enables you to adjust highs, mids and lows according to your own taste. Mids and highs are pleasantly clear and understandable  perfectly fine for small rooms. Thanks to the 360° design sound is emitted evenly through the room and the speaker can subtly be placed anywhere in the room. The fun does really start when you buy two speakers, though  and you usually get a good discount on the second speaker then. The two speakers can either be placed separately in two different rooms where they can play back music individually or synchronized. Or they can be married to a stereo pair  which brings the already good sound of the speakers to their full potential. I also recommend the TruePlay feature, which uses the iPhone mic to measure the sound environment and adjust the acoustic settings of the speakers to them. This can make quite a difference in acoustically complex rooms. Small and subtle speaker that comes with full and clear sound despite its limited dimensions. It can only be used through the app, but this works easily and intuitively.